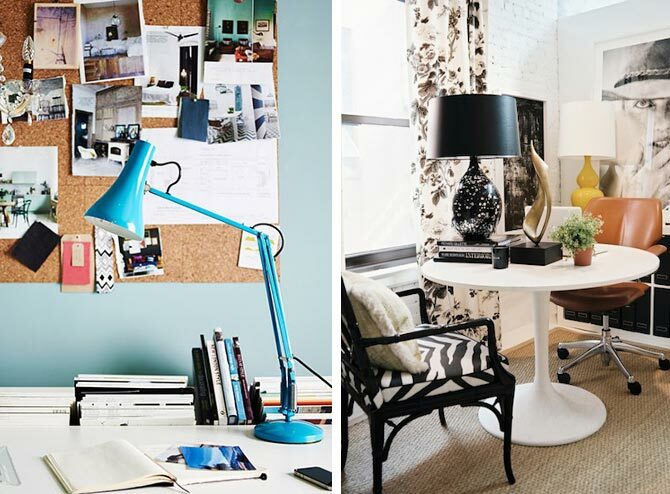 Is your home office fairly basic, not particularly functional or simply not a very inspiring space to work in? Then it sounds like it’s time to get down to work and whip your workspace into shape! 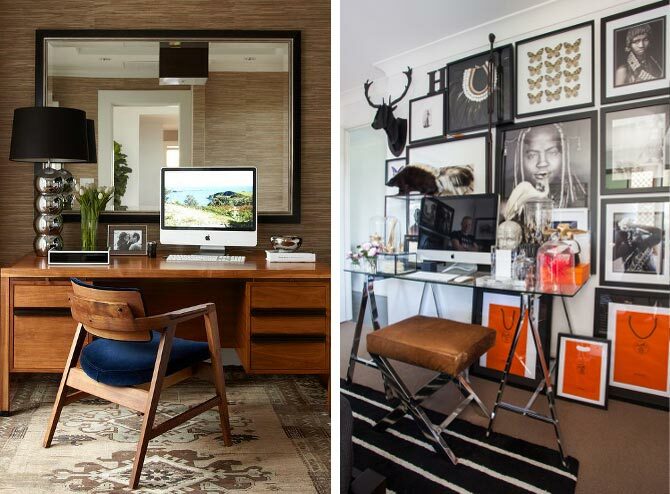 If you’re not quite sure where to start, steal some decorating ideas from the home offices below; they’re not only stylish but practical, comfortable, creative and look like a joy to work in, too. Transforming one of your walls into a moodboard is a great way to add colour and visual interest to your space, while making it more inspiring, too. 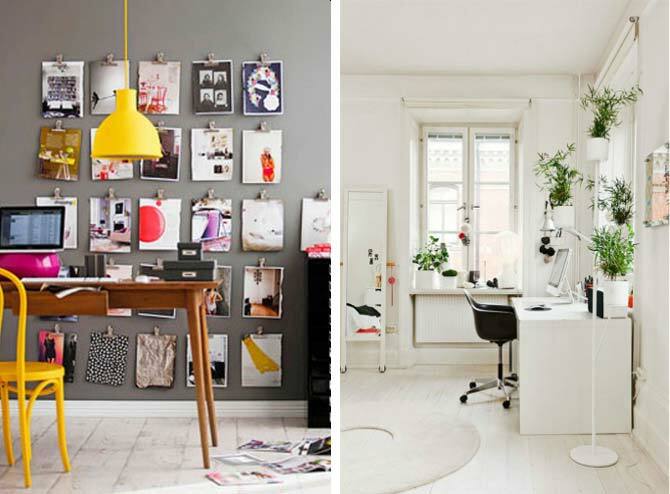 Hang a large corkboard on your wall and tack magazine clippings, photos and quotes haphazardly across the surface, or take a leaf from this room’s book, and arrange a selection of inspiring images in a grid-like format on your wall for a more structured and graphic look. Lush, leafy indoor plants will instantly infuse your workspace with a fresh, inviting and calming vibe, and a pop of lively colour. They’re also known to boost productivity and creativity, as well as help create healthier living environments, which makes them a great addition to any study, especially for those who work from home. Images: Marie Homer (photography)/Erin Michael (styling) via Real Living ; Freshome . Why choose a boring, run-of-the-mill desk, office chair or bookshelf when you can select furniture that’s fun and packs a visual punch instead? We’re more than in love with the oh-so chic neon pink desk pictured here – notice how it instantly brightens up and adds personality to this eclectic space. Seriously, we need it. Now! These days, most people tend to rely on their digital calendars on their smartphones, tablets or computers to keep track of daily tasks and important reminders, but it’s often useful to have a tangible version of your schedule on display in your study. But don’t just run out and buy any old calendar (any that feature pictures of cute, fluffy baby animals or vacay hotspots should be banned!) – look for a stylish planner that suits the style of your workspace, or make one yourself, like the DIY chalkboard calendar shown here. Images: Lonny ; Victoria Pearson via Country Living . Keep your office organised with storage solutions that are practical but offer look-at-me appeal, too. We’re crushing hard on the colourful desktop organiser and magazine holders pictured above; the fact that they’re so chic provides ample motivation for anyone to keep their workspace clean and clutter-free – after all, you wouldn’t want mounds of paperwork and other desk-top debris detracting from the beauty of these eye-catching organisers, would you? When choosing a colour scheme for your home office, it’s important to consider how you use the space, and the mood and look you wish to create in the room. A soothing palette of neutral tones is ideal for those who desire a work area that’s calming, peaceful and encourages productivity. Introduce touch-me textures and pops of colour in the form of art, decorative accents and flowers to add contrast and visual interest to get those creative juices flowing. Images: David Cleveland via Hibrid ; Freshome . Is your study on the compact size? Hanging a large mirror in the room will give the illusion of space and make the work zone feel airy, brighter and more inviting. Mirrors with decorative frames can work as striking design elements, too. 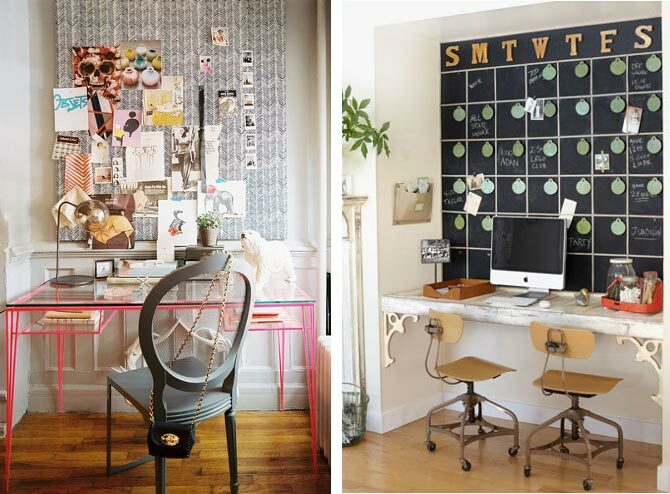 Not sure what to do with that vacant wall in your office? Transform it into a gallery wall, and fill it will a carefully curated selection of framed photos, art, inspirational quotes, keepsakes and other wall décor. It will not only inject the space with personality and show-stopping style, but provide you with plenty of inspiration (or a distraction, when you need a break!) while you work. Images: Matt Sartain (photography)/Urrutia Design via DecorPad ; Sukio . Open shelving is a smart and stylish storage solution for any home office. Why? They ensure everything is easily accessible and provide a home for treasured photos, mementoes and other decorative accents you wish to put on display. Is your office kitted out with only the basics, with no fun details, colour or hint of any personality in sight? Well, you need to fix that, stat! While adding art and photos to your work zone is one way to do this, introducing colour and pattern will breathe life and a hearty dose of character into any lacklustre room, too. 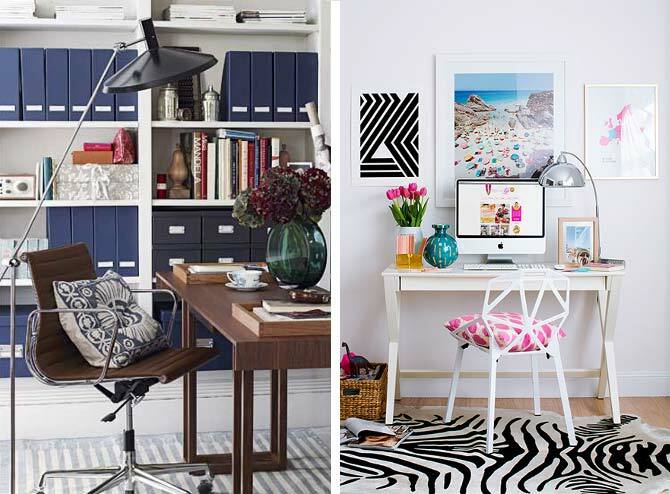 Notice how a bold zebra-print rug and bubblegum pink and white patterned pillow instantly lift the look and vibe of this space – we can definitely see ourselves working here; can’t you? Images: House to Home ; Hannah Blackmore Photography via DecorPad . Good lighting is essential in any workspace. Look for overhead lighting and a desk or table lamp that’s functional but offers standout style, too. We’re partial to pendant lights, as well as sculptural and colourful lamp designs. While aesthetics are an important consideration when it comes to choosing an office chair, remember, you’ll spend most (if not all) or your time sitting on it – rather than looking at it – so comfort and ergonomics come first. Look for a chair that’s cushioned, has armrests, is adjustable and offers good back support. We’re a fan of the tan leather swivel chair you can see here – it looks comfy and oh-so stylish. 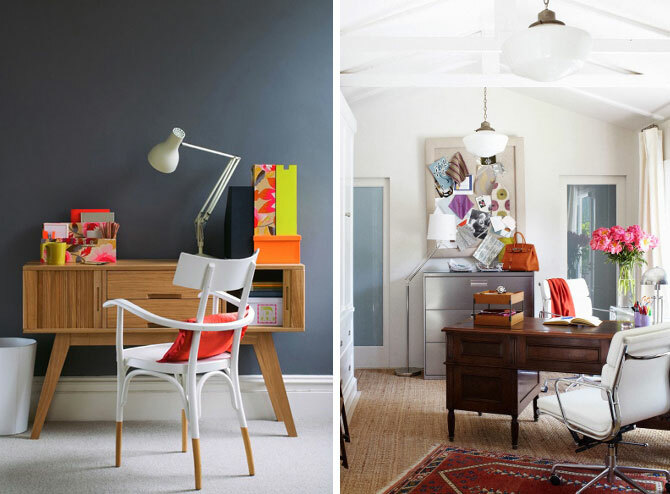 Images: Lisa Cohen via House to Home ; Lonny via DecorPad .